Maryland requires supervisors of food service establishments and non-retail food service establishments be certified in food protection. This means a person-in-charge, an owner, or manager of a food establishment – (i.e., restaurants, bars, cafes, bakeries, delis, mobile vending, food trucks, assisted-living, day care centers, and convenience stores) become certified by taking a approved food manager training course and successfully passing an accredited food manager certification exam. Baltimore Environmental Health Services (EHS) requires the operators of each medium and high priority food service facility to have a certified food manager on site during all hours of operation. 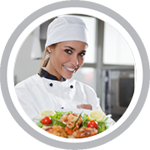 Certified Food Service Manager – Level I is required for medium and high priority facilities. These facilities can operate one or more days per week. If a non-profit facility operates four or more days per week, a Certified Food Service Manager – Level I is required. Download the Certified Food Service Manager – Level I Application (PDF). Certified Food Service Manager – Level II is required for a volunteer fire company or bona fide non-profit fraternal, civic, veteran, religious, or charitable organization that operates a high or medium priority food service facility three days or less per week. Download the Certified Food Service Manager Level II Training registration (PDF). We offer online HACCP Training in Maryland for: Baltimore, Columbia, Germantown, Silver Spring, Waldorf, Ellicott City, Glen Burnie, Frederick, Gaithersburg, Rockville, Dundalk, Bethesda, Towson, Bowie, Aspen Hill, Wheaton, and many more!